Sky Kart at Fujimi Highland (天空の遊覧カート) is one of the popular tourist spots located in Fujimi Kogen Resrt, Nagano Prefecture. You can access to the Fujimi Highland that is 1420m high by kart within 25 min. It has a great view of Minami Alps mountains and Mt. Fuji. Around the end of October, you can enjoy great Koyo, the Autumn leaves. At the top of the hill, there is a strolling trail to enjoy beautiful Japanese maple trees and great golden carpet of Mt. Yatsugatake. 1. use JR Chuo Line to Kobuchizawa Station. 2. use a local bus to Fujimi Kogen Resort. Fujimi Kogen Resort is located in Fujimi, Nagano Prefecture. It has Karts that automatically giving you the ride to the top of the hill that has a great view of Minami Alps, Mt. Fuji and Mt. Yatsugatake. 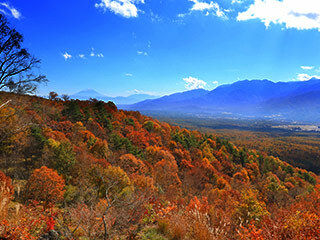 Around the end of October, the small pine tree forest under Mt. Yatsugatake will have a beautiful Autumn Leaves that is called a golden carpet. There are a restaurant and gift shops at the parking.